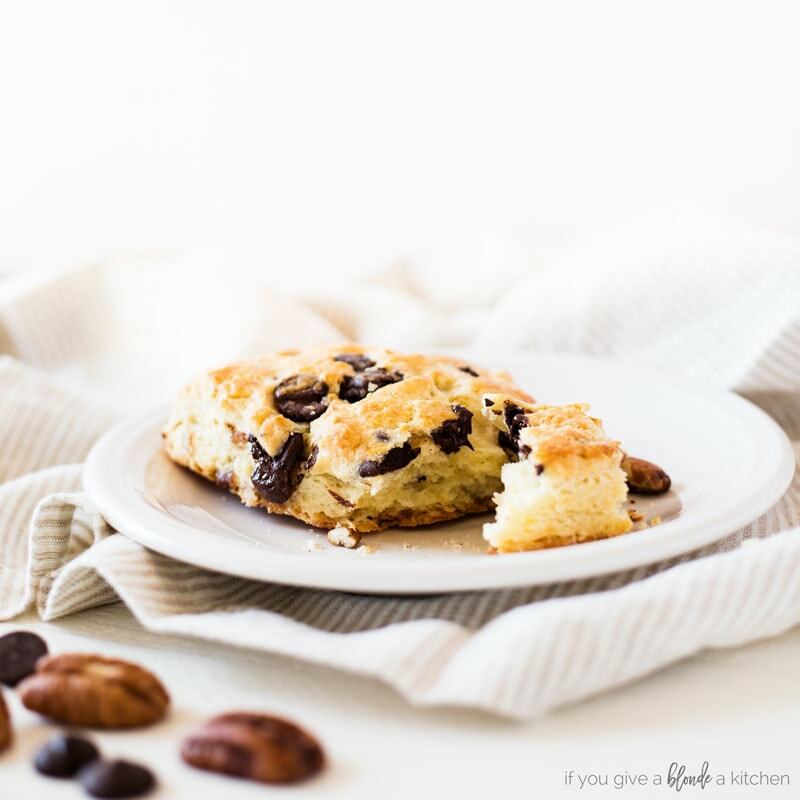 Chocolate pecan scones are buttery, flaky breakfast pastries filled with chocolate chunks and chopped pecans. Try this recipe adapted from Ina Garten! It has been a while since I have baked scones! I stumbled across Ina Garten’s recipe for chocolate pecan scones and I knew right away I had to bake them. These scones are buttery, flaky and full of flavor. The chopped pecans add some texture while the “puddles of chocolate” add some sweetness. Believe me when I say, you have to try this recipe! When baking scones, work with cold ingredients—specifically the butter, eggs and cream. This will keep the dough cold and create rich, flaky scones (instead of heavy, dense scones). The chocolate chips and chopped pecans will distribute evenly in the dough if you toss them in flour. This step will keep the chocolate chips and pecans from sinking to the bottom of the scones during the baking process (Similar to how you would coat blueberries in flour for blueberry muffins). For a shiny, tasteful finish, brush the scones with an egg wash and sprinkle with coarse sugar. Keep reading for more tips on baking scones! There are many false preconceptions about scones. They’re not hockey pucks or doorstoppers. Scones are buttery, flaky breakfast pastries. The key to getting this texture is using cold butter cubes and mixing the dough very little. When I bake scones, I cut the butter into ½-inch cubes and keep it in the fridge until I am ready to add it to the mix. That way the butter remains cold for as long as possible. Once the butter is added to the flour mixture, I mix for barely 2 minutes. Look for pea-sized bits of butter. From there, work quickly to make sure the butter stays cold! Avoid overworking the dough when forming the scones. The heat of your hands warms the butter more quickly. Many scones call for an egg wash, and these chocolate pecan scones are no exception. The egg wash creates a shiny, golden coat on the outside of the baked scones. A simple egg wash calls for 1 egg and 2 tablespoons cream (or water). Use a pastry brush to lightly coat the outside of the unbaked scones. You will likely not use all of the egg wash. A light coat will do! A sprinkle of coarse sugar is also a nice touch for scones. I usually sprinkle a bit on top of the egg wash right before the scones go in the oven. 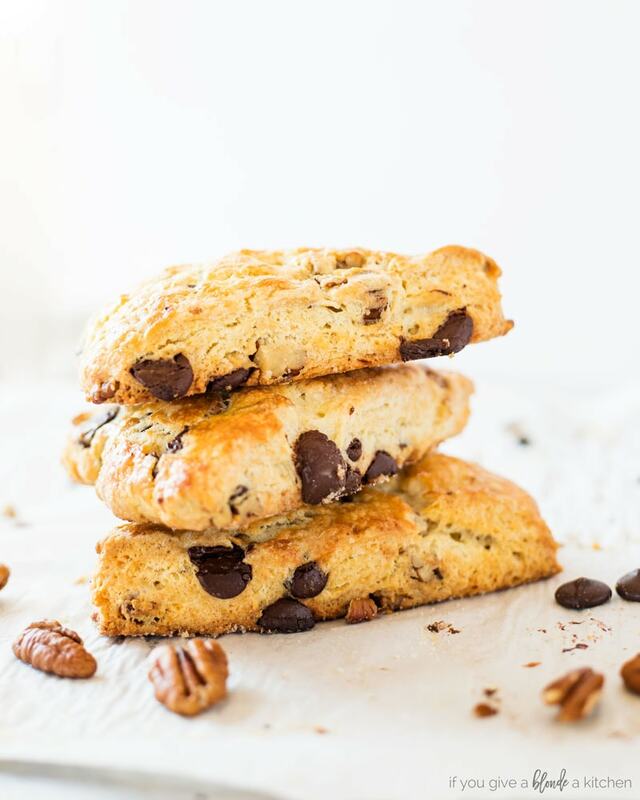 If you like chocolate pecan scones, give these recipes a try! Preheat oven to 400° F and arrange oven rack in the center of the oven. Line a baking sheet with parchment paper. In a small bowl, stir together chocolate chips, chopped pecans, and 2 tablespoons. flour in a small bowl. Set aside. Using a stand mixer fitted with the paddle attachment, combine 2 cups flour, baking powder, salt, and 1 tablespoon sugar. After 30 seconds, add the cold butter cubes with mixer still on low speed. Beat mixture until pea-sized pieces of butter form, about 90 seconds. In a small bowl (or in a measuring cup), whisk together the cream and 2 eggs until combined. With mixer on low speed, pour cream mixture into butter mixture and beat just until blended, about 20 seconds. (The dough should not form into a ball in the mixing bowl It’s a good sign if you still see pockets of flour). Add chocolate chips and pecans, and beat just until combined (the dough will be very sticky). Transfer dough onto a well-floured work surface and knead a few times (avoid overworking the dough), just until the dough forms a loose ball and chocolate and pecans are evenly distributed. Dust with flour as needed so the dough doesn’t stick to the surface. Flour a rolling pin and roll dough into a circle 8-inches in diameter and ¾-inch thick (it’s a good sign if you should see lumps of butter in the dough). Use a sharp knife to cut dough into 8 wedges. Place scones on prepared pan 2 inches apart. To make egg wash, whisk together 1 egg and 2 tablespoons cream. Brush tops with egg wash to make a light coat (you won’t use all of it). Sprinkle with sugar. Bake scones until tops are lightly browned and insides are fully baked, about 20 minutes. Serve warm or at room temperature. If you are sensitive to salt in baked goods, lower this amount to 1 teaspoon. I personally like a hint of salt to counteract the sweetness. Scones are best when eaten the day they are baked. Store in an airtight container at room temperature for up to 3 days. Recipe adapted from Ina Garten’s from Cook Like A Pro: Recipes & Tips For Home Cooks. Had me at chocolate and pecan! Not to mention how much I love scones! Can’t wait to make these! 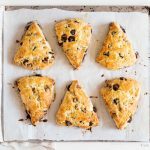 Scones are pretty traditional with just raisins here in the UK, but I love the sound of these chocolate ones for something a bit more indulgent. These scones are so beautiful! I’m allergic to pecans but bet I can sub out for another type of nut. Yum! Can never go wrong with Ina. Scones are delish any time of day! I can’t eat chocolate, bit I will be making these with WHITE chocolate very soon!